Lucy Martin creates paintings to reflect her lifelong connection with nature. In them she expresses her love of the mingled strangeness and beauty found in the forests she loves to explore. Her hope is to awaken a feeling in the viewer that there are myriad tiny worlds to be discovered right at our feet, if we stop and look. Lucy Martin’s interest in botanical art has evolved to concentrate on the beauty and amazing diversity of fungi. 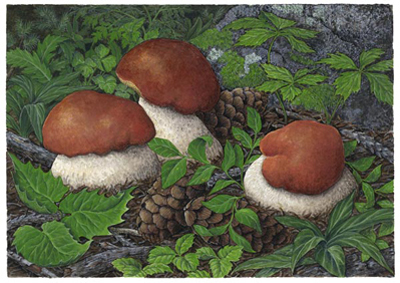 She paints mushrooms as very much part of their environment– rather than as isolated specimens, in the more familiar tradition of Botanical Art. Thus the decaying leaves, moss and twigs, the burned log or lichen-covered tree stump, are characters in the small landscapes Lucy reveals. She has participated for the last 4 years in the juried Open Studios Art Tour sponsored by the Cultural Council of Santa Cruz County. 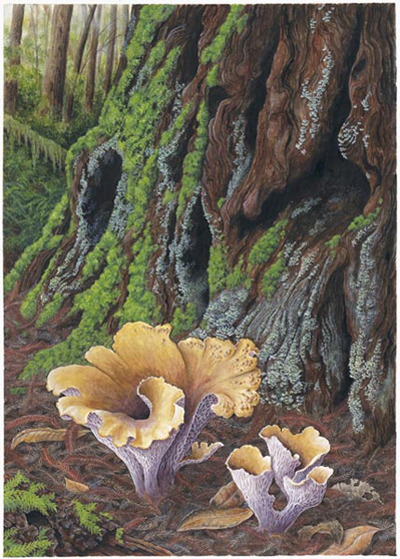 Her show, “Secrets of the Forest: Portraits of Wild Mushrooms” was presented at the Helen Crocker Russell Library in Strybing Arboretum in San Francisco January through April of 2012. Her original work has been purchased for the Permanent Collection of the Special Collections and Archives Department at McHenry Library of UC Santa Cruz. Lucy lives and works in Felton, California, in the Santa Cruz Mountains. Her paintings are mainly set in this area, but also include forest scenes from the Bay Area, Mendocino, the Sierra Nevada,Washington State and other areas of the US. All artwork and photographs copyrighted by the artist. Copying, saving, reposting, republishing of artwork prohibited without express permission of the artist.